Socks and Puppets, the comic » 326 – What is this? 326 – What is this? In my mind, I have a huge list of jokes for apple-related products and programs that take the form “i(thing)” – it can be pretty fun to invent new ones. This comic falls into the “experimental format bin” through necessity. The dialogue in panel 3 must only contain the lines “What is this?” “iDon’tEven” or the joke fails to reference the meme adequately. However, the scene needs to be set for this to be a joke. However, for this to work as a joke, the punchline must be at the end. The natural solution (to me) is to reverse the order of the panels, and explain this change to the reader. 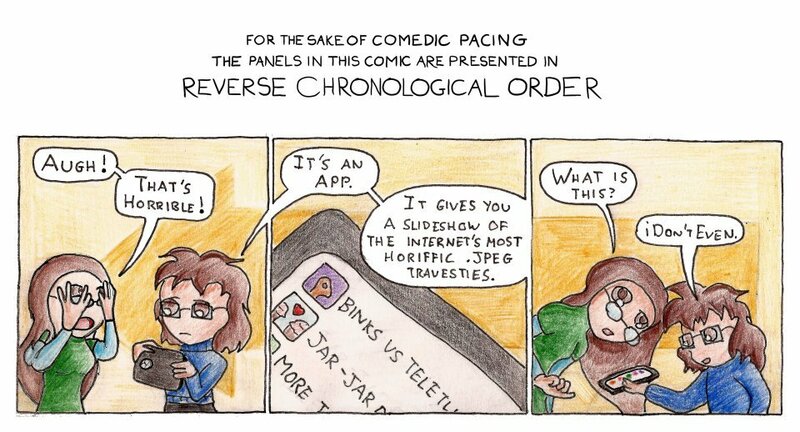 This way, the panels read to make a joke, as we are progressively shown earlier snapshots of the conversation. I’ve seen this technique applied narrativistically before, but for such a cheap joke, it’s kinda fun to go to this extreme.